Quietly spoken and firmly focused on the value of having Asian faces on the screen, Sky Crompton, a director, producer and film scholar based in Melbourne, cuts an interesting figure. 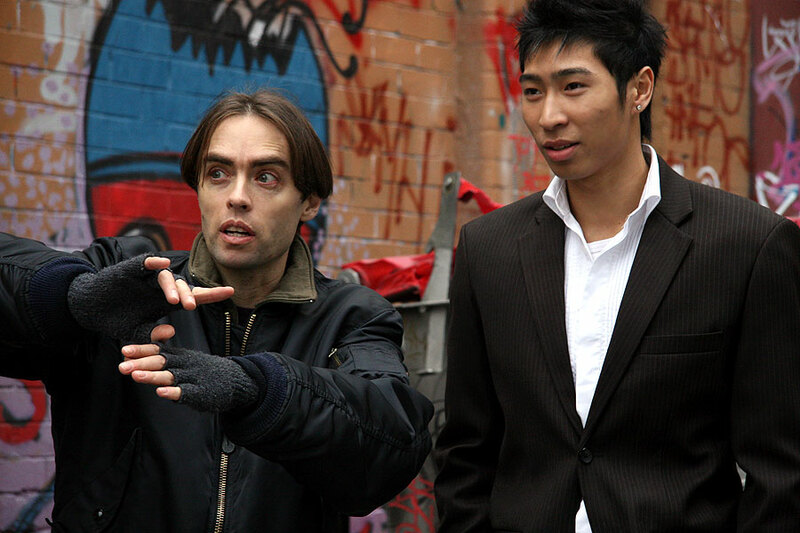 Of White Australian background, he is one of only a handful of filmmakers of non-Asian Australian background to create and cast films with all the leads played by Asian Australians. This includes his first feature Citizen Jia Li, which screened at the AAFFN’s inaugural event, as well as at the Phoenix Comicon Film Festival, Yellow Fever Independent Film Festival and Melbourne Underground Film Festival (MUFF). The actors in Citizen Jia Li are also an interesting combination. Claudia Teh, who plays the title role of ‘Jia Li’, a Chinese Australian living in Melbourne but with transnational ties back to China, received a nomination for her performance for Best Actress at MUFF. Susanna Qian, who also stars in the award winning Red Water Red, plays her best friend ‘Daisy’, a harajuku girl of Chinese and Japanese heritage whose dress-style epitomizes the eclectic fashion mash up and coolness of the famous Japanese subcultures seen in the district of Harajuku. And, Christopher Pang, who plays Jia Li’s Asian Australian boyfriend ‘Kong’, was also the lead character in the blockbuster film Tomorrow, When the War Began. While audiences may wait for certain Asian stereotypes to take hold – the troubled migrant, Asian gang member, and kawaii/cute Harajuku girl – each character has unexpected layers, a touching vulnerability and depth, and all the actors have a real star quality and presence. Sky shares some of his reflections on his experience making Citizen Jia Li below. 1. What was your goal when you made Citizen Jia Li and what do you hope audiences take away from the film? When I conceived Citizen Jia Li i wanted to tell a story that told a uniquely Asian view of Australia. I hope that they enjoy the experience and are empowered by the characters journey. 2. Chris Pang is an inspiring figure for Asian Australian actors for many reasons, including having a ‘can do – let’s do it’ attitude to making stories that reflect multicultural Australia, and being incredibly generous and supportive of his peers. Additionally, he has shown that it is possible for Asian Australians to be cast as the lead in a major blockbuster like Tomorrow, When the War Began. Not only that, but he plays the romantic lead, which is rare for Non-White actors, both in your standard Hollywood film and locally. What qualities, as a director, did you see in Chris when deciding who to cast as Kong? As a director I have developed a refined casting process over the last few years. This involves looking for cast who are open to developing their character and have what I perceive as range. In talking to Chris I found some one who had these qualities, as well as star potential which I was important to the project. 3. What about your other lead actors Susanna Qian and Claudia Teh? Claudia was Jia Li in so many ways, while being an untapped talent who has masses of potential, as her Nomination for best actress [MUFF 2011] attests. Susanna has an amazingly impressive range and her transformation in to Daisy was everything I hoped for and a consummate piece of acting. I opened the script and particularly their dialog to full discussion. I believe it is essential to get the ‘truth’ of the story thought collaboration, and this was the case with both the cast and key crew members. 4. Was it hard to train them to play other ethnicities? No because they were professional actors and knew their jobs well. It was a real pleasure each day to come to work. With Susanna we got her some coaching in Japanese and she just worked hard. They all did. 5. Is there a big response to casting calls for Asian Australian roles? I should say from the beginning that I don’t do casting calls. I know my characters, do my research as to who is out here and then ask to meet with a few specific people who have the potential skills. So casting Citizen took me 3-4 months and to be honest, it was not easy to find Asian Actors. It was even hard to find out about casting agents who looked after Asian actors. After I had contacted them. It became easer but the fact was that there were few to choose from compared to other ethnicities. And as with all Australian actors, if there is little work, that means little experience. And the level of experience one gains is a big factor in the skills that the actors have to show. It can be a vicious circle of needing skills to get work and needing work to get skills”. 6. What other Asian Australians would you like to work with and who are some names to watch out for? This is a tough one. As a director, I am at the point where I need to work with two types of cast: a) a highly skilled exceptional cast and b) draw card names. As a producer the choice is easer. I would like to work with Corrie Chen as I believe she shows real talent as a director and my long time collaborator Daniel Yun, who is a Director of Photography, has amazing sensitivity. As far as cast, I would straight away want to work again with a number of my cast from Citizen. I think that Susanna Qian has not had the opportunity she deserves and has an amazing talent and range. Many audience members think that Susanna was a Japanese actor, which is amazing as she is about as Aussie as they come. Chris and I also intend to work together again in the near future, and there are a number of projects where I would like to work with other cast members from Citizen in a more extended way, so we’ll see what happens. So to answer your question there are AA filmmakers I want to work with but we need to help them to get the profile they deserve as actors and filmmakers, to give them a real future in the growing Australian and global film industry. 6. What’s your impression of the Asian Australian Film Forum and Network and where could it head next? I think it is a much needed gathering of like minded people to discuss their work and develop connections for the future. To be effective, filmmakers of ‘Asian’ content need to engage regularly and in a meaningful way, and the AAFFN can do this by facilitating a continuing dialogue with between AA filmmakers.